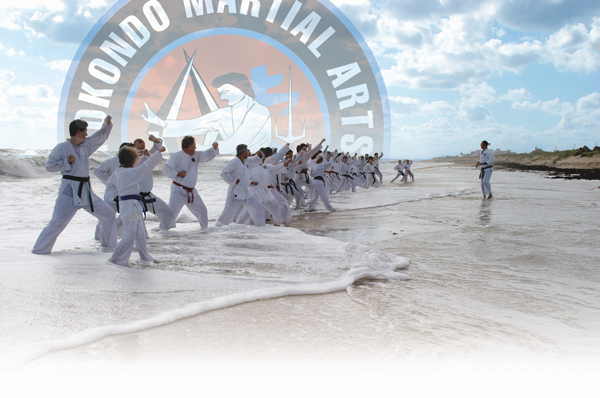 Kokondo Karate is primarily a Japanese style of karate founded by Master Arel in 1970. As is the case with most popular styles, it is a compilation of several systems. The sources come from Japan, Okinawa, China, Burma, Thailand, and the Philippines. The primary influences are early Kyokushin Karate, Isshin-Ryu Karate, Sankata Karate-Jutsu, Sanzyuryu Jujitsu, and Jukido Jujitsu. There are currently hundreds of styles of karate being practiced, with the majority of these having been developed within the last forty years. In name, our system is one of these. In principle, Kokondo is as old as the oldest known martial art. In technique, it is among the “art of the ancients” while in contextual approach (self-defense) it is relevant and modern. Self-defense was the original intent of all martial arts. Self-defense remains the intent of Kokondo. Unfortunately, this is not the case with the vast majority of martial arts systems in the world today. Self-defense training must take into consideration the various methods of attack and defense. This includes: all possible types of attack, direction, range, multiple attackers, and weapons. To have a realistic chance of successfully defending oneself against a larger and stronger attacker, the student must train all possible types of attack while having only one rule to follow: the response must be appropriate to the situation. Shorin-ji (points and circles) is a fundamental principle in Kokondo Karate. This influence comes from China. Shorin-ji promotes speed and fluidity. The combination of circular defenses and low, strong stances with linear striking techniques provide a student with an arsenal of very powerful techniques. Jushin (center line) is another fundamental principle. All techniques directed to the attacker’s center line will be significantly more effective. When a technique is directed to the center line, the attacker absorbs the entire amount of energy directed to him. When a technique is not on center line, the body will move or rotate. This movement will reduce the amount of energy applied to the target area. Kuzushi (unbalancing) is a principle which uses the motion or energy of the attacker. When a person is over extended or off balance, there is uncontrolled energy in that direction. The defender, with proper balance, distance, and timing will make use of this energy. By adding the attacker’s energy with the defender’s energy a very powerful technique is generated. The essence of any traditional Karate system is kata. A systems intent and approach to self-defense is determined by the way the system executes its kata. Examples include the difference in stance depth and length, and linear or circular motions. Kokondo includes a large number of kata. There are a number of kata which are unique to Kokondo, as well as most of the more advanced kata of the Shotokan and the Goju-Ryu syllabi. The benefits of studying kata are numerous. The value and importance of kata to a system cannot be over stated. Kata contain every concept or principle within the art; they contain the entire knowledge of the system.